When it comes to decorating I push boundaries, not crazy boundaries but ones that I have found over the years are pretty transformative. One of the single most important things you can do to a space any space – big, small, old and wonky, new and modern, poky or palatial is to paint the ceiling out the same hue as the walls. I’ve done it in every single room of my pad, without fail – whether the room is painted inky Hudson black, bruised Mulberry red or a punchy Wooster olive. It’s a simple trick but one that always seems to scare people the most. I kind of don’t get why? Whenever I recommend this – in interviews, to friends, clients, customers in the store, guests at the design school, strangers on the street (OK not quite, but I can be pretty evangelical when it comes to interiors), all these people scrunch up their faces in bewildered fear, and I always get the same flat “NO”. In my interior designer days I was constantly on the battlefield, trying to convince and coerce people into trusting me, to make them think outside the box and be a bit bolder. Sometimes it took a trip to my pad so they could see in real life just how transformative it is, sometimes I shoved a zillion inspirational images under people’s noses until they finally caved in and go with it just to stop me! Today I’m going the image route (although if you do want to see my pad in person, I’m running my next monthly Design Masterclass at my home on 13th August). So without further ado, above are just some of my heap of convincing images. That’s all the reason you could possibly want for painting your ceiling the same shade as your walls, right there. When you paint the ceiling out, lines blur, the space becomes more sophisticated somehow, and the room feels grander. According to the Madani Group Painting in Winnipeg, this is even more true for a small room or a room with dark walls, where all too often there’s a massive contrast between the walls and ceiling. It even works in rooms that have are patterned or wallpapered – check out Nikki Tibbles‘ pad above. It’s such a simple trick, but it’s weirdly the biggest obstacle I’ve faced time and time again. So now I’m trying it on you guys. Paint your ceiling out the same colour as your walls (no matter what colour your walls happen to be) and then stand back. The difference is A.M.A.Z.I.N.G. Don’t let your ceiling stay white and unloved and forgotten, it should join in the colour party with the walls! So tell me – have you painted your ceiling yet? If not, why not? The rooms like great with ceilings woodwork etc painted in same colour. I would like to do this but have just had new windows put in which have just been painted a soft white and white shutters have been ordered. I am redecorating the room in a blue grey colour – would painting the ceiling and woodwork in the same colour look odd with big expanse of white woodwork/shutters in bay window? Hi Abigail.. we have gone dark in our basement dining room (we used your madison grey!) – the ceiling is v.low and cant be more than about 6ft high – should we still paint it out? Also im about to go dark in our bedroom, and i was wondering about the doors .. would you paint the doors the same colour even if it leads to another room with another colour – as that would mean painting it different colours on each side? Totally paint the ceiling the lower the ceiling the more important it is to paint them the same colour as the walls you will love it promise. Also yes paint the doors the same colour I’ve done exactly as you say with one colour one side and one the other. Keep me posted with how it all goes! mad that the end result would be amazing. My mother in law walked in and walked out again, she thought it was awful! Fast forward two weeks and when she came back she could not believe the transformation. She even said that going dark had made the room seem bigger somehow. I have to say that it is the best decision I have made and I am so glad I didn’t leave the ceiling white as I know the space would not have looked as good. So thank you for your top tips and encouraging me to give this a try. I can’t wait to tackle the next room on the list now. Love your style its great! I’m painting my bathroom walls and woodwork all black, now do I paint the ceiling black too although the tiles around the bath to ceiling are white? will it still have an impact? Thanks for that Abigail, gonna do it even though my husband is a bit sniffy. Having said that he didn’t want me to paint the walls in Off Black, he loves them now, so what does he know! I have painted my living room walls in a very dark grey and I love it, but I kept the ceiling white mainly because our house was built in the 1960 s and therefore has no beautiful features. I’m frightened that if I paint it in the same dark grey it’ll just look a bit blah. What do you think? DEFINITELY do it! Here’s the same room in my pad before/after painting the ceiling – the difference is just so magical. Honestly, you’ll wish you’d done it years ago – doesn’t matter what sort of house you live in, it will make the space bigger, grander, cooler, promise. If you’re really worried about it you can get some inexpensive faux coving and just glue or nail that into place. But I wouldn’t bother personally, particularly because once you’ve painted everything dark all the corners blur into beautiful shadows anyway! I have painted my living room wall in a very dark grey and I love it, but I kept the ceiling white mainly because our house was built in the 1960 s and therefore has no beautiful features. I’m frightened that if I paint it in the same dark grey it’ll just look a bit blah. What do you think? Hi Abigail , I couldn’t agree more , I hate when I see quite a beautiful dark room on social media only to look up and see the ceiling is white or a paler shade of the walls . It really cheapens the look . My home is painted the same colour in each room throughout, woodwork, doors ceilings etc , it’s so cocooning and ups the stakes a thousand fold , I think this is your best tip ever and your followers should bite the bullet and just do it . IT TRULY IS A GAME CHANGER . Just to say very quickly that I’ve painted ceilings in grey, Mulberry Red and Wooster Olive. At the time I felt quite brave as none of the rooms are huge or have lots of light. But now I’d do it without even thinking twice! I love ceilings painting in the same colour as the walls, and I have now started to transform one more room! I use a max shine on the ceilings which is amazing. Thanks for all your tips along my way, it is really life changing and amazing! Totally with you, I have painted my ceilings out at home and everyone that see’s it love it but not one of my clients have ever signed it off when I have suggested it so still yet to do my first painting out of the ceiling for one of my projects. I will keep going!! 1. I second your thoughts, Abigail. I have done the same in my house. 3. In many Asian countries, like India, it is very common to find such houses. It looks amazing! Wow! What a wonderful room! Thank you so much for sharing this information with us. Obsessed with your amazing blog! I am painting my master. I wantusurper dark grey walls. Love Down Pipe, but no where lose or me to buy. Thinking Benamin Moore Steel Wool? 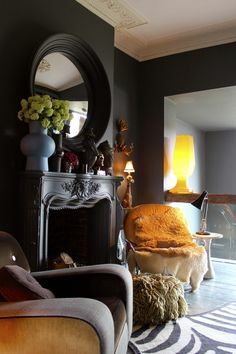 Want a great dark grey. I love painted ceilings, however I have 4in white plantation shutters attached in white. If I paint my crown molding the same as walls and ceiling what do I do with window trim and doors? Thanks!! IÂ´m a Norwegian girl that is pretty new in the blog- world. I was googling “popular english blogs” and found your blog. I like the idea of painting my living room ceiling in the same color as the walls, but i must say IÂ´m a little reserved about doing that. The color on the walls is 6005-y70r, so it is a pretty dark color. Do you have any experience with painting the ceiling that dark? Thank you for sharing such inspiring posts! Hi Marte, I paint ceilings dark all the time from the darkest black to the darkest grey and it looks amazing so I wouldn’t worry. When you paint a ceiling the same colour as the walls the lines merge and you almost create infinity so the room feels grander, edgier and way more sophisticated than if it were white. Hi Abigail, just visited your store for the first time a couple of days ago. I wanted to live there 🙂 Really liked the area in general have to say. I recently moved from an old house with high ceilings and great features to a recently new build appartment (just a square concrete, no charme whatso-ever, but no more neighbour noices:) with low ceilings (245cm) in Amsterdam. The old house I painted many dark colors including the ceiling and loved it. But now I’m a little afraid to go dark let alone paint the ceilings. I picked colors for the walls close to F&B’s blue grey / vert de terre. Would you still recommend painting the low ceilings the same colors? I certainly would if you paint the ceilings the same colour as the walls they won’t feel as low. I love low ceilings embrace them and painting out the space dark will be magical, cosy, sophisticated truly beautiful so if it were me I would do it! Love this dusty pink sofa. I love the simple use of one colour in the background and the forefront a soft pink..not oo overpowering but still makes a bold statment bringing in the subtle colours in the pics on the wall. Love grey! That is my ultimate-favourite-go-to-happy-walls photo. We just bought our first house and the requirements were it had to have high ceilings and my husband needed to learn how to plaster so we could recreate this look in our living room (only with bi-folding doors). HAHAHA I’m remembering my husband’s face when I told him I wanted the ceiling the same color as the walls in a room he was painting last year. I wanted my ceiling to look higher. He gave in and it does look wonderful. I just received your book A Girl’s Guide To Decorating today and already love it ~ such fun! Hi Abigail! I have been enjoying your blog for a while. I totally agree about painting the ceiling the same color. I recently painted the ceilings and wall of my teeny tiny kitchen a pale grey. It actually looks bigger. Oh Abigail – this is truly inspiring! I am shaking a little but the ‘man cave’ back in Melbourne will appreciate this look. Rug up and thank you. Thank you, had forgotten the ‘rug up’ term, like it! Hi Abigail! I was a serial lurker last year but I’ve finally decided to come out of the closet – so to speak – and to tell you that your blog has been hugely instrumental in helping me begin to articulate how I’d like my home to look and I’m so grateful to you for that. One question, though – what finish do you recommend for a textured ceiling before painting it? Thanks! First of all, thank you for your inspiring words each morning. Checking on your blog is the first thing I do each day. I leave the house with my head buzzing with excitement and a spring in my step! I have just completed an upholstery course and won a pale pink velvet wing back chair on a certain auction site. I now know that gold fringe ( as in the photo) is the only way to go!! I cannot wait until your book arrives (per-ordered)! I am sure I will be driving my friends and family mad even more than ever, trying to convert them to the dark-side – Abigail-style! Thank you for sharing so glad it makes all the difference and never a truer word spoken, its only a pot of paint! You will need to sand and then prime it (the top coat of paint will adhere far better than) and then you just have to select the finish. Eggshell which has a slight but very slight sheen or gloss, and the more off unconventional you can go with the paint colour the more rock starish it will look! Thanks so much, really appreciate the tips. It would make all the difference in the world to a small treatment room as it will literally make if feel larger than if the ceiling was an alternate hue. Plus you will be the leader of the pack seeing that most other treatment rooms are so dull! This advice is great timing. I am just about to paint our living room with Farrow & Ball’s dovetail (I know not as dark as you would like but it’s a start). I will do the ceiling too and how about the door and window frame? It’s a large window but north facing. Hope you feel better soon! Dear Abigail, Would you suggest painting the door frames and window frames in the same colour also? Would you use the same type of colour? Often the frames are painted in a glossy paint.. But i would like my walls to be in a matte colour. The bright white against the dark grey I want might look wrong? Any suggestions? What a fabulous trick for decorating, can’t wait to try it for myself! You won’t regret it promise, and try to ignore naysayers the more people say nay say yay, at least that is what I do! I’ve painted the ceiling …. Yay!! It looks soooo nice. The quality of the paint is so good that it didn’t drip at all and it is really glossy. So happy to have closed my ears shut to nay-sayers!!!! Thank you for your encouragement. Sorry your not feeling so good, hopefully you’ll fell better soon. I totally agree with you re: painting ceiling the same colour as the walls, I feel it helps to cocoon the room and therefore large or small, you can cosy up in it. Loving your example pic! I have recently signed up to your blog and have to admit I love it! I loved it even more when I found out you were as mad about dogs as I am! I’m hoping to purchase a small victorian cottage with my boyfriend in the near future so I’ve decided to start a scrap book of the looks I like so I know how I want to decorate once we’re in. One question. Where do I get the paint, without having to get a loan out?!? Any other victorian cottage tips apprectiated!